Clockwise from top: Six Bougies logo; Kim at the fabric market in Dakar; Megan at a craft fair in Dakar. Photo credit: Six Bougies. Having repatriated some years ago to the United States, I occasionally still crave the adventure of living abroad. But then I console myself by recalling the Internet journeys I make every week on behalf of the Displaced Nation, in search of international creatives. Those virtual journeys can open my eyes to whole new worlds full of breathtaking color—rather literally in the case of Six Bougies, a siteI landed on from Pinterest several weeks ago. It turned out to be the companion blog for a business of the same name, run by two American expats in Senegal, the equally bedazzling Kim Rochette and Megan Carpenter. Kim and Megan are my guests today and will talk about how they came to a life of spinning Western clothes, accessories and home wares out of gorgeous West African fabrics. But before we proceed, I want to make sure you know how to pronounce “bougie.” I initially made the mistake of pronouncing it with a hard “g”—which led to a vision of two American women in colorful garb boogying down the streets of Dakar, Senegal’s capital city. Outlandish, I know. (Besides, who were the other four?) So take my advice and start practicing now practicing how to say “bougie” with a soft “g”: boo-gee boo-gee boo-gee boo-gee boo-gee boo-gee. As for why there are six boo-gees, read on. Almost needless to say, it’s a colorful story! Greetings, Kim and Megan. Before we get to the meaning of “Six Bougies,” something we’re all curious to know, let’s cover a few of the basics. How long have you been running the business? 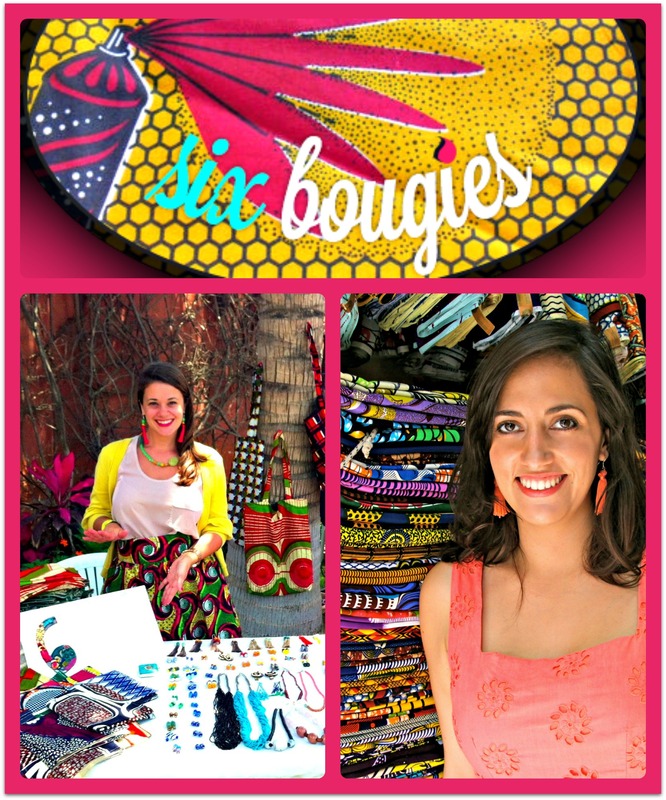 In your Etsy shop you describe Six Bou-GEES as “a lifestyle brand that fuses West African textiles, colors and patterns with a Western aesthetic.” What do you mean by a “lifestyle brand”? MEGAN: We’ve conceived of Six Bougies as a brand that appeals to people who yearn for travel and love to surround themselves with beautiful objects from around the world. Our pillows, neckties and bags can add a little of that spice to everyday life. I understand that you have a blog that supports this brand? KIM: Yes, as I try to show with the Six Bougies blog (I’m the the writer of our team, while Megan is the artist), the concept goes far beyond a selection of home wares and accessories for sale. I post about fashion, expat life in Africa, local decor, cultural events in Senegal, and related topics. A few months ago I did a post full of tips on how to have Western clothing made by African tailors. Dakar, where we both live, has affordable tailors at every street corner and a wealth of vibrant textiles for sale at the fabric market. Soon I will write about my attempt to commission furniture for my apartment with local materials from Senegalese artisans, but with a Western aesthetic. Ah, that sounds like a good example of “African-Western fusion”—true of your product line as well? KIM: Yes. We use fabrics purchased (and mostly made) in Africa and rely on the expertise of local tailors to execute Megan’s Western-influenced designs, with an international audience in mind. The duffel bags Megan designed are a perfect example of this African-Western fusion, as is our line of neckties in wax. Six Bougies products: cushion, tie, and duffel bag (we’re giving one away!). Photo credit: Six Bougies. Please tell me what “wax” is. KIM: “Wax” is short for “wax print,” which is similar to batik printing. In Africa, these prints are made on colorful cotton cloths, which are mostly industrially produced. So, where did the idea for Six Bougies originate? MEGAN: I had been teaching in Senegal for about a year, acquiring (stockpiling?) wax fabric, beads, and other locally produced goods. It was everywhere, in just about every room and closet of my apartment. But I never had anything made because I was nervous as to how my vision would be executed. But at the end of my first year, I decided to bite the bullet and have 15 pairs of size 8 shorts made in wax. Most of my friends and family (females) are the same size-ish, and I would just give them out as gifts when I went home. They were a huge hit: some friends and family actually wanted more than one pair! That gave me the confidence to start making more products, and eventually transition this into a business. KIM: About a year ago, I felt the itch to start my own blog on life in Senegal—but beyond the travel blog I had previously updated for family and friends, I wanted to create a space for telling the story of what it’s like for a young, international woman to live in West Africa and travel the region for work, trying to carve out a place in this sometimes crazy and always invigorating place. I also have a great love for design and textiles, which has grown exponentially living in such a tactile, sensory locale. Megan and I decided to join forces and build a brand that melds our passion for West African textiles while also empowering women in the process. Before we get to the topic of women’s empowerment, it’s high time we learned how you got that unusual name…as I think it relates to that goal? KIM: We named the business “Six Bougies” after an iconic African pattern by Vlisco that depicts six bougies (spark plugs). A person would wear this fabric to signal that they had a six-cylinder car, a sign of wealth. Eventually, the fabric came to symbolize female empowerment in Africa. Thus “Six Bougies” perfectly marries our passions for design and women’s rights. Tailors Penda and Adji at work in Dakar. Photo credit: Six Bougies. Please tell me that I’m not the only one who mispronounces “bougie”? KIM: People do mispronounce it sometimes, but it was a risk we were willing to take! Moving over to your decision to donate a portion of your business’s profits to support and empower women: why that cause in particular? KIM: In Senegal, tailoring is traditionally a male-oriented career path. Honestly, there aren’t a lot of jobs out there for women, especially single women and/or mothers. So when I meet a female tailor, I try to help them out by giving them business because I know how hard it is to branch out and do something different. And, as Megan and I are both involved in education, we hope to steer our business efforts to this cause as well. We are both very inspired by Della, a similar business based out of Ghana and LA which has really taken off in the past year, partnering with Apple, Urban Outfitters, and Vans to build a veritable social enterprise in Hohoe, Ghana. “Sew” very happy in Dakar! Moving on to your expat life in Senegal. What brought you to Dakar originally? KIM: I first studied abroad in Dakar when I was a junior in college and returned after I graduated. I’ve been living here for nearly four consecutive years. I had always been drawn to African literature, film, and history; and then when I had the opportunity to live in Africa for a semester, I was drawn to Senegal for its complex history with France (I am half-French) and role as as a hub for development in West and Francophone Africa. After studying in Dakar, I was hooked. MEGAN: I was working at an inner city charter school is Los Angeles as a teacher and decided it was time to teach in a different part of the world to have more access to places that would otherwise be difficult and expensive to reach. There were lots of offers for the Middle East and one for my current school in Senegal. I chose Senegal because the school is highly regarded as a stand out in the region and the country seemed like a fascinating mix of modern yet traditional ideologies. I’ve been here three years and am so happy I took the leap. What do you like most about life in Dakar? KIM: I love so much about it! I love the inspiration at every turn—the textiles and local arts, the warm and embracing people, the ocean and cliffs, the music scene. I also love living outside all year round in this coastal, tropical climate, especially after growing up on the East coast with such frigid and long winters! I love how nearly every experience, even and especially the challenges I encounter as an outsider, lead to personal growth. But in many ways, Dakar is also easy; as an expat, I am able to live a comfortable life, eating out, living in a spacious apartment, enjoying all the cultural events the city has to offer, and escaping much of the patriarchy to which most Senegalese women are subject. I am privileged in Dakar and I try not to take that for granted. MEGAN: Even after three years, there is still so much to discover in this city. I am constantly finding new inspiration in the culture and the people. Do you ever feel “displaced”? KIM: I know what you’re saying: what’s a nice girl like me doing living in a boisterous, developing African capital?! It has taken four years, but I have definitely found my niche in Dakar—sometimes to the surprise of friends and family back in the U.S. and France. But there are inevitably moments I feel “displaced,” especially as women living in a patriarchal society. I encounter sexism on a daily basis and there are still cultural nuances that boggle my mind. I’ve written about Dakar’s “Bottom Ten” on the blog. I also travel throughout West Africa for my “day job,” which entails working extensively in the male-dominated commercial sector. I’ve fielded many advances that might border on sexual harassment in the U.S., and sometimes I don’t feel taken seriously as a woman. In certain settings, I have to be very aware of how my “Western” actions (like direct eye contact!) might be interpreted by men and women of vastly different backgrounds. But learning how to carry myself and to pick up on cultural cues in these extremely diverse settings has also become some of my greatest strengths. I wouldn’t trade these formative experiences for the world! MEGAN: I’m not going to lie, the first year was tough. The Air France flight I was on landed in the middle of the night, which is when most flights arrive and depart from Dakar. The director of my school picked me up from the airport, which is probably one of the most depressing ones I’ve ever seen, and then drove me through the main thoroughfare, La Corniche, to my apartment, which, in the dead of night, looked like block after block of deserted burnt-out buildings. I thought to myself, “I think I’ve made a terrible decision and how the $@&*% can I get out of here! ?” Luckily, my impression of the city has changed dramatically. Getting to know a bit of the culture and cultivating meaningful friendships with locals as well as the expat community has helped me feel at ease. Do you sometimes feel more comfortable in Dakar than you do back in the U.S.? KIM: For now, Dakar is home to me. I have a solid group of friends, a real sense of community, and I live here with my boyfriend. But I’m able to travel back to the U.S. two to four times per year for work and holidays, and I relish these opportunities. To be honest, I feel comfortable in both countries. I grew up living between countries—France and the U.S.—and I think this has conditioned me to adapt easily to new environments and transitioning between them. That being said, I do plan to “settle” in the United States eventually, and suspect that reintegrating into American life will be challenging as I moved to Dakar right after graduation and haven’t really lived a typical adult life in the U.S. I’m sure it will be more difficult to build the kind of community you find easily with fellow expats living abroad. We’ll see if life goes according to plan! MEGAN: When I first moved to Senegal I was in the downtown area people watching and spotted two young talibé boys, probably around seven or eight years old, having an argument. It escalated into blows but then was quickly broken up by a passerby, who was only a few years older than the boys. Watching this teenager mediate the fight instead of walking by like nothing was happening (or worse yet recording and posting it on YouTube) made me feel good about being here. The way people treat each other feels a little more humane, a little more civilized. KIM: Honestly, its not something I had ever really considered! I studied Political Science and envisioned working in the development sector. And now I’m doing both… building a creative business while working as a consultant on various development initiatives. MEGAN: Being an entreprenuer is in my blood. My dad has started several companies and family dinner conversations often included new business ideas. When I went to Summer Art Camp in high school I used my fake ID to sell cigarettes. I had a streak of badass in me back then 😉 I also set up a impromptu face-painting stand with my friends at an art festival, donation based. Between those two enterprises I made a killing that summer and was able to afford…you guessed it…more art supplies! During college I studied fine art, mostly drawing and painting, which I now teach. Making paintings for example can be extremely consuming (time and otherwise) and has the possibility to take over your life, while making jewelry is instantly gratifying as well as therapeutic. So I really enjoy making jewelry and designing totes and accessories in my spare time. KIM: With a demanding “day job,” it has been challenging giving Six Bougies the time and dedication the company really needs to get off the ground. I’m transitioning to pursuing freelance projects so as to devote a lot more time to Six Bougies in 2014—which I’m very excited about! From a business perspective, it has also been very challenging developing reliable systems to support our creative pursuits. For example, it can be difficult to find tailors who are consistently available for work or willing to teach other women the skills necessary for making our products. In Senegal, most tailors are men so we are still trying to develop the most sustainable system for training women that we can work with longer term. MEGAN: Kim summed it up pretty well. We are working on sustainability and exposure! KIM: As the primary blogger in the duo, I absolutely love connecting with people through my posts, especially women who are moving to Dakar or are interested in following a similar path. And as Six Bougies’ social programs develop, I really look forward to the deeper connections and impact we will hopefully make in our Senegalese community. “Sew” much fabric, “sew” little time! KIM: I already feel rather stretched, so for now I’d just like to work on Six Bougies and my other professional endeavors to my best ability and see the fruits of that labor! MEGAN: I think I have the best of both worlds right now, but I would love to be able to be in my studio more and really dedicate time to my personal artistic pursuits. MEGAN: Actually taking the leap and traveling for a year…or longer. Do you have any advice for others who are thinking about setting up their own lifestyle brand and selling fashion/homewares? For instance, you’re selling your merchandise through an Etsy shop. Is that working for you? MEGAN: Etsy is great for where we are at right now, very small scale. I think if business continues to grow and we need to do more shipping overseas, we may have to change our distribution system. Do you have any big plans, travel or business wise, for 2014? MEGAN: I’m traveling to Nigeria next month for a volleyball tournament with my students. Then the trifecta of New York, Texas, and California to see family and friends later this summer. As far as the business goes, I’d like to focus on perfecting the quality of our goods and hopefully getting them into boutiques in Dakar and New York. Inshallah, indeed. Readers, has this interview boo-gee-ed, I mean sparked, any thoughts or questions? Make your comments colorful, why don’t you…there’s an African-Western-fusioned duffel bag on offer! Not an exciting comment, but I have to say i AM excited by both the entrepreneurial spirit AND the way these amazing women are spreading both color and employment! Very impressed, and in the midst of this very cold winter, those colors look especially happy. Thanks! No kidding! One of the the things I miss the most when I live in the States is all the colors–sometimes it seems like people here tend to wear black and grey all winter long, I guess because it’s available, but these colors are so cheerful! And these women are doing something really cool by making it available to us! Such a fabulous spirit these two women have. The ‘Just do it’ attitude they’ve made their dreams come true. A colourful company with personality for colourful and bright people. Well done ladies. Keep up with brilliant work. I receive so many compliments on my Six Bougies bags and pillow cases. Friends and strangers mostly enjoy the story behind them. Amazing work, ladies! Awesome effort by two incredible ladies! Love the way you want to “spark” the lives of local women. The two of you DO make a Difference! Love the path you’re carving! Megan & Kim! Thanks for the gifts that you create. I love you dedication and hard work. Eric loved the tie! It was a big hit. Keep the creations coming. Wow! I love this! I’m finishing up a six month study abroad program in Dakar and have a love affair with wax fabric. I’m trying to stock up before I leave for the US 🙂 You guys are so talented and take in the craziness of Dakar with so much grace! 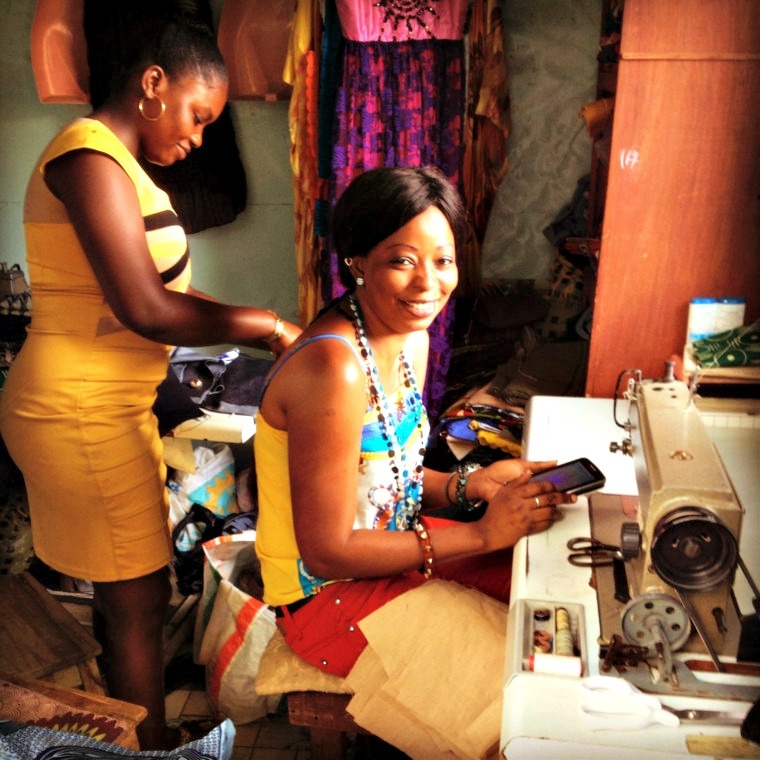 An inspiring group of women making beautiful African-inspired fashion! I love how they use those African patterns to create contemporary designs. I live in Peru and have also met here many entrepreneurs, both locals and foreigners, who use traditional Peruvian patterns to create something new and interesting -and have even interviewed some of them for my blog. I think it’s important to keep the tradition alive and innovate at the same time. Reblogged this on Black N Business. J’ai fait ta connaissance par l’intermédiaire de Martine COMMON qui est une amie depuis 2013 et qui me parlais souvent de tes expositions que j’ai jamais eu l’occasions d’assiter. J’aime le mariage de couleurs et les motifs.